Make a thinner cut through material and drill holes up to 3X faster with the Milwaukee® 9/16" One-Piece Steel Hawg® Cutter. This long-lasting cutter features carbide teeth and an alternating tooth form geometry to cut holes fast in steel, stainless steel and cast iron that's up to 1/2" thick. The milled 3-flat shank is designed to fit into 1/2" chucks. 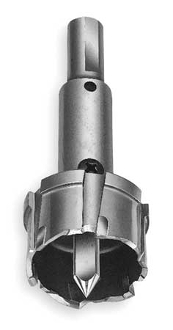 Milwaukee's most popular specialty steel drilling accessory, the One-Piece Steel Hawg Cutter is often used to cut a hole 1/16” larger than a bolt. It can be used with most electromagnetic drill presses and fits most 1/2" chucks.